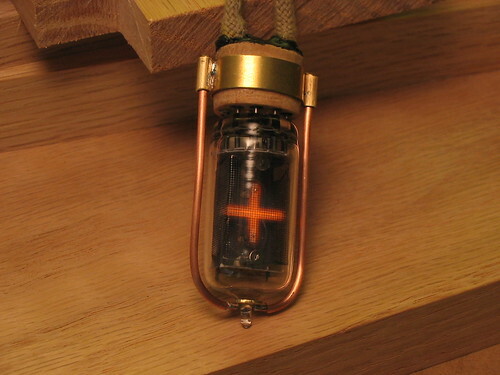 Somebody at Maker Faire was interested in Nixie tube jewelry that actually lit up. I decided to take up the challenge. The hard part is not making everything small, but making it last a long time on a single battery. In this case, the battery is a CR2032 lithium coin cell. 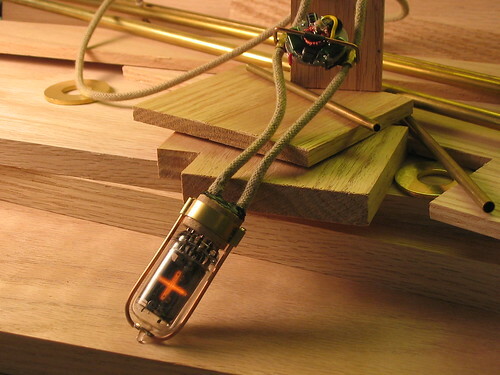 A small circuit takes the 3 volts and steps it up to about 150V which is barely enough to light the Nixie tube. Theoretically it should last around 10 hours or so. The socket was constructed using my custom-made Dremel drill press. To figure out where to drill the holes, I put some clay on top of the wood and pressed the pins of the Nixie tube into the clay. Then it was a simple matter to mark the pin holes, remove the clay, and drill. The pins are actually from a DB25 solder tail socket, since they fit the Nixie pins perfectly. The power supply circuit has its problems, and I am trying to improve on it. What electronic components do you use here?